The “Land Research Center” issued a press release, on Friday, stating that 120 Palestinians will be displaced and prevented access to their farmlands due to an Israeli military plan, and a military training drill being conducted in the Jordan Valley.The center stated that eighteen Palestinian families received military orders, issued by the Israeli Army, ordering them to stop the construction in Khirbit Ibzeeq area, north east of Tubas. The families were ordered to stop all agricultural and civil constructions in the area under the pretext that it falls under “Area C” as classified by the Oslo Peace Agreement, therefore, they need to obtain construction permits from the so-called Israeli Civil Administration, and not from the Palestinian Authority. The Center further stated that, besides displacing the families, including at least 66 children, the new military order was issued amidst extensive military trainings in the area, an issue that had a direct impact on the produce of agricultural lands that belong to the residents of the Tubas district. The area has already been impacting by Israel’s illegal policies, especially by preventing agricultural produce from being transported to other parts of the occupied West Bank; the Plaines Area in the Jordan Valley is known as the “Fruit Basket of Palestine”. It is worth mentioning that military drills in the area have already led to the destruction of more than 400 Dunams (98.84 Acres) of Palestinian farmlands. Head of the Ibzeeq Projects Committee, Ali Turkman Sawafta, member of the Al-Hroub family, one of the families that is heavily impacted by the Israeli violations, has been living in Khirbit Ibzeeq since 1961, six years before the 1967 six-day war in which Israel occupied the rest of Palestine, and that the residents have official documents proving they are leasing the lands from their Palestinian owners. Sawafta added that the Israeli occupation insists that the lands in question are “state lands”, an issue that violates International Law as those lands belong to residents displaced during the war. Khirbit Ibzeeq is only 8 kilometers away from Tubas; it is considered one of the Bedouin areas in the Jordan Valley where the residents live in extreme poverty, without access basic services including health care, running water and electricity. They bring their water from Tubas by tanks driven by agricultural tractors. The Land Research Center said that displacing the residents, and stealing their lands, is a direct violation to all international treaties and regulations, as they call for upholding the rights of the civilian population living under occupation, and during the time of war, in addition to ensuring they lead a safe and dignified life. — This is a segment of a report by the UNITED NATIONS Office for the Coordination of Humanitarian Affairs in the occupied Palestinian territory – Humanitarian Factsheet on Area C of the West Bank – JULY 2011. – Over 60 percent of the West Bank is considered Area C, where Israel retains extensive control, including over security, planning and zoning. – An estimated 150,000 Palestinians live in Area C, including 27,500 Bedouin and other herders. – More than 20% of communities in Area C have extremely limited access to health services. – Water consumption dips to 20 liters/capita/day (l/c/d) in communities without water infrastructure, one fifth of the World Health Organisation’s recommendation. – Communities depending on tankered water pay up to 400% more for every liter than those connected to the water network. – 70% of Area C is off-limits to Palestinian construction; 29% is heavily restricted. – Less than 1% of Area C has been planned for Palestinian development by the Israeli Civil Administration. 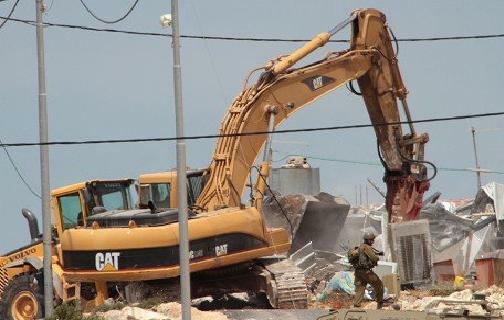 – 560 Palestinian-owned structures, including 200 residential structures and 46 rainwater collection cisterns and pools, were demolished by the Israeli authorities in 2011. – 1,006 people, including 565 children, lost their homes in 2011, over twice as many in 2010. – Over 3,000 demolition orders are outstanding, including 18 targeting schools. – The planned expansion area of the around 135 Israeli settlements in Area C is 9 times larger than their built-up area. (B’Tselem). – Approximately 300,000 settlers currently live in Area C.